An autographed copy of The Silenced Majority: Stories of Uprisings, Occupations, Resistance, and Hope by Democracy Now! 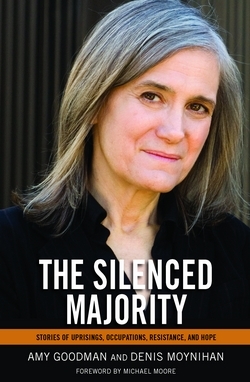 host Amy Goodman with Denis Moynihan. The Silenced Majority pulls back the veil of corporate media reporting to dig deep into the politics of “climate apartheid,” the implications of the Fukushima nuclear disaster, the movement to halt the execution of Troy Anthony Davis, and the globalization of dissent from Tahrir Square to Liberty Plaza. Throughout Amy and Denis show the work of ordinary people to change their media—and change the world.